Mara Branscombe has the kind of radiance that glows from the inside out. We connected with her on how true self care starts with getting quiet, reflecting on our innermost desires, and allowing time to rest. She believes (and so do we) that living your best life starts with listening to your body and your mind. Creating space for new perspectives, listening to the intuitive call to action, and leaning into what nourishes you will help you flourish in every season. Sounds easy, right? According to Mara, it can be, when you consciously invite stillness into your daily routines. She shared with us some ways to cultivate the health of your mind, body and soul this season by shifting habits and placing value on your well being. Read on for Mara’s suggestions on how to find stillness to help you foster self care. 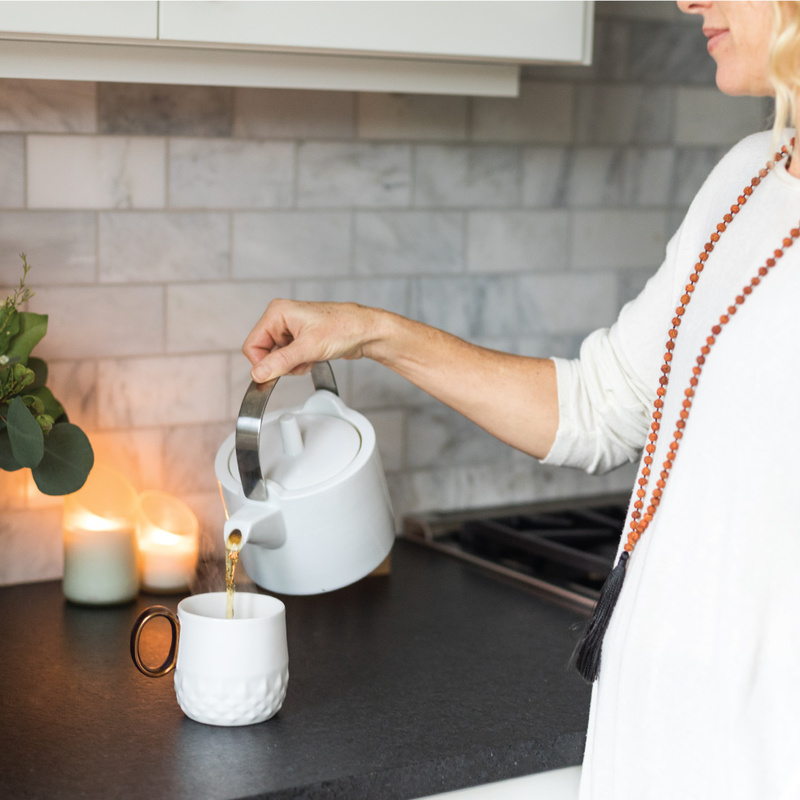 By creating space for rest and stillness in your day, even for a few minutes, your inner self can begin to express the emotional patterns and stressors that are negatively affecting you. Developing a calm awareness of your thoughts is the key to staying steady and on the mindful path towards your best self. No really, put your phone away -- and do it at least an hour before bed. Imagine the effects on your mind when you beam light and information directly into your eyes when you’re trying to wind down. If it seems counterproductive, that’s because it is. Ask yourself: what am I getting from an extra dose of social media before I turn out the lights? Would I be better served by reading a book? Now that you have an hour of screen-free time, choose an activity that will further support a calm and relaxed entry into dreamland. 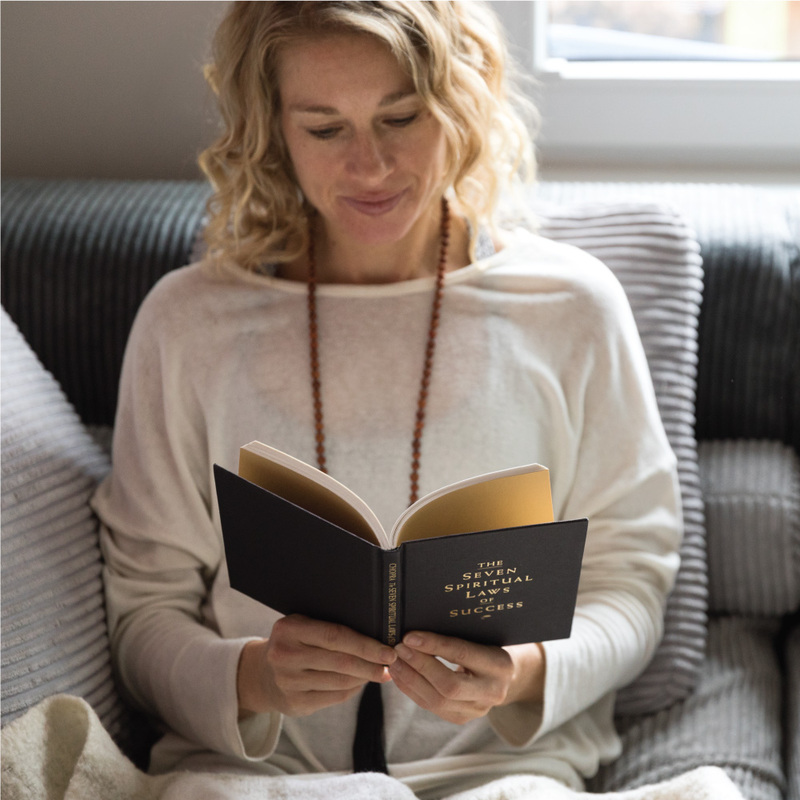 Try reading a book, journaling, or a short series of restorative yoga poses to give your body and mind gentle cues that it’s time to chill. 1. Seated Spinal Twist (Ardha Matsyendrasana): Relieve lower back pain and facilitate positive digestion. 2. Sphinx Pose (Ardha Bhudjangasana): Relieve low back pain and menstrual bloating, opens the lungs, chest and shoulders. 3. Child’s Pose (Balasana): Release tension in the low back and hips and calm the nervous system. Instead of hitting the snooze button in the morning, hit pause with a 10-minute meditation. This will set your day off on a focused, supported foot, and push aside the frantic energy so many of us are used to in our mornings. At night, access the same reflective state by repeating the same meditation. (Remember all that phone-free time you have now?) Calming your thoughts at the beginning and end of your waking hours will help maintain an inner peace all day long. 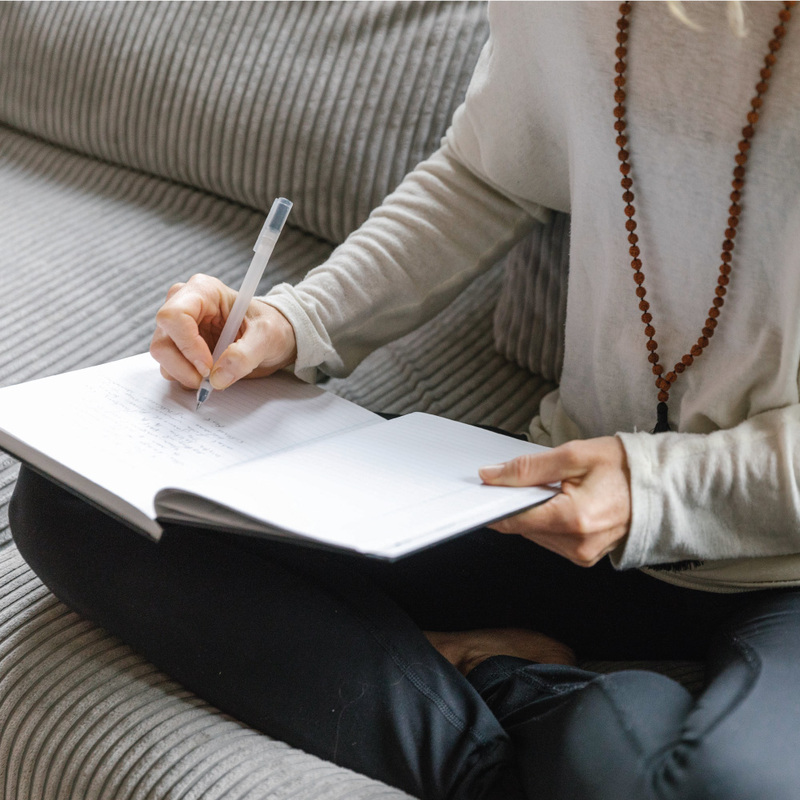 Sometimes uncovering your negative beliefs about yourself is as simple as writing them down. The trick is to start shifting your mindset to the positive by reframing the negative. Just like pulling weeds from the garden allows our food and flowers to grow to their full potential, we can pull out the thoughts in our minds that are limiting us. Draw a line down the center of a page. On the left side, write down your top three negative thoughts about yourself. (This could be anything from “I am always tired” to “I am not worthy of love”: anything that makes you feel-less than-awesome. On the right side, rewrite your negative belief into a positive statement. (If you’re always tired, try “I can grow with more sleep”. If you believe you are not worthy of love, rewrite to something like “I love myself unconditionally”. Start with a new page and write down your top three positive qualities. Be generous with yourself: what do you love about yourself? Now that you’ve done the journaling, put the positivity into practice. Take the separate page with your top three qualities written down, and read it as many times throughout your day as you can. Take a screenshot of your positive affirmations and use it as your phone homescreen, or try posting them beside your bathroom mirror, or even on your computer monitor. Refocusing your mind on the positive will help you keep your focus there, and slowly transform your inner beliefs. Commit only to the practices that inspire you and leave you feeling connected to your whole self. Lean into what already lives inside you and what nourishes your body, mind and spirit. What energy/needs/desires did you leave behind in the past year? What are you ready to invite into your life this year? Now, close your eyes and visualize. When you release what you need to and invite the new, what does your life look like? Describe it to yourself, making sure to use the present tense. Speak to yourself as if the life you dream of is already a reality. Notice how this feels in your body and mind, and hold onto that feeling. Does it feel expansive? Does it feel light? Write all these thoughts and feelings down. Though it may seem counterintuitive, rest and stillness are the catalysts for change in our lives. Leaning into what nourishes your inner self, what brings you joy, balance and peace will naturally bring forth your authentic radiance, your spark of vitality and a freedom to witness your wildest dreams come true. Many thanks to Mara for sharing her wisdom and insight to help us find stillness in this season of rest, recovery and renewal. Mara’s ability to hold healing space for the hearts and minds of others offers a vast landscape for transformation within. In her yoga teachings, Mara weaves together her background as a dance artist, her practice in the shamanic tradition, and her twenty years of experience on her mat—naturally what arises is a fluid, earthy, full-bodied practice. 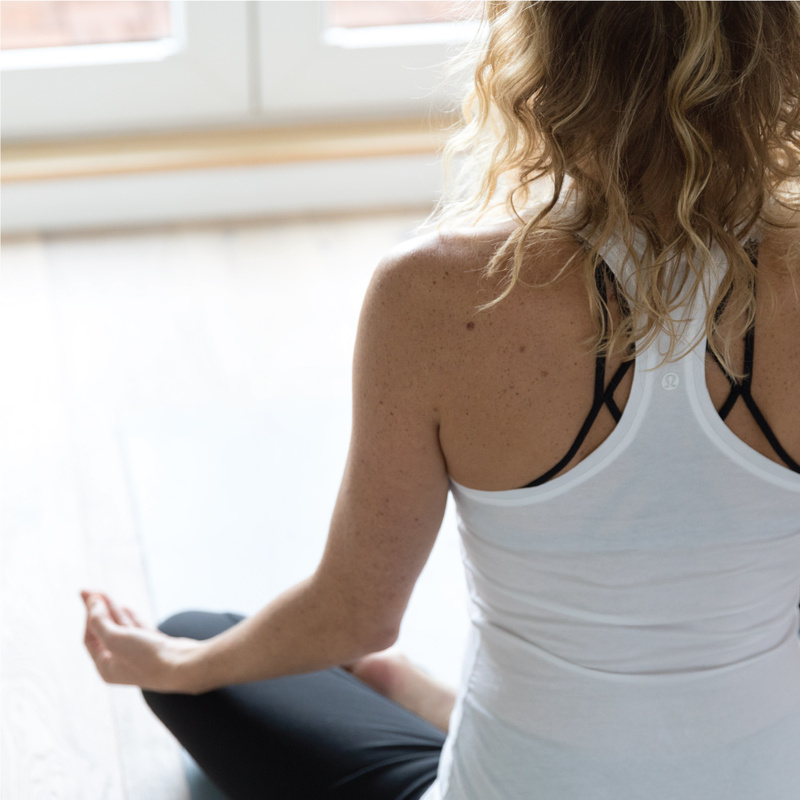 Her intention is to make yoga and meditation accessible to every person willing to step onto their mat and commit to putting their best self forward. Currently, Mara hosts international yoga retreats, fuses yoga and corporate leadership to executive teams, teaches professional athletes and artists, mentors yoga teachers, and teaches classes and workshops in Vancouver, Canada.